Homepage. 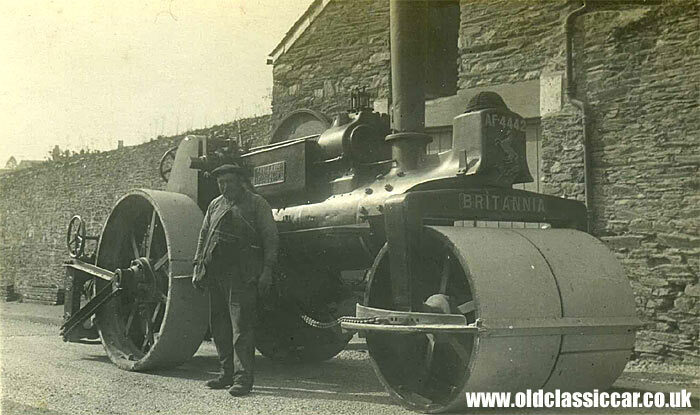 This page: Early photos of steam road rollers seen in black and white, sometime in the 1930s. 1. Aveling and Porter 'Britannia'. The two photographs shown here turned up in a batch I bought recently. 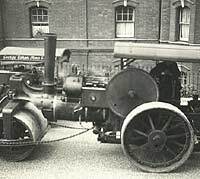 The vehicle shown, named 'Britannia', is an Aveling and Porter steam road roller (not a traction engine!!) which was built back in 1915. The first photo shows the roller from behind, with its burly driver stood on board. Judging by the soot covering him from head to toe, he'd already been at work for some time when this picture was taken. Happily the Britannia (Aveling and Porter number 8548) still survives and now lives in Abergavenny, fitted with a canopy but still in road roller configuration. The second photograph, below, shows Britannia (registration AF 4442) from the front, with its swarthy owner/driver posing for the photo. Single cylinder roller no.8548 was built in 1915, with two gears, and delivered as 'Britannia' in April of that year to R. Dingle & Sons, of Stoke Climsland in Cornwall. Apparently this was their first Aveling roller, the previous six were Garrets. 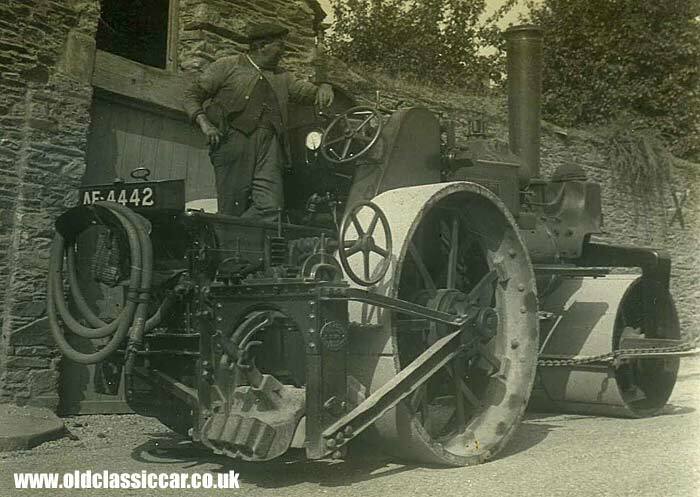 In 1955 the roller was sold on to James and Cockerell, who were civil engineers near Salisbury. I'm not 100% sure when the photographs on this page were taken, but I suspect in the 1930s, so during the Dingle's ownership. Later renamed 'Tulip', AF 4442 worked in and around the Salisbury area, finally being sold for scrap in 1965. Happily the scrapman's torch never got near to the roller's boiler, and, following storage for 30 or so years, it was restored back to use and is now taken to various events during the show season, in the livery of Henri Collings. 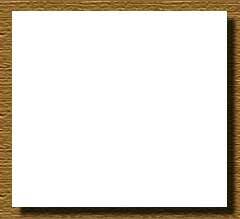 These snippets of information were found on this site, where some recent pictures of this roller can be seen. 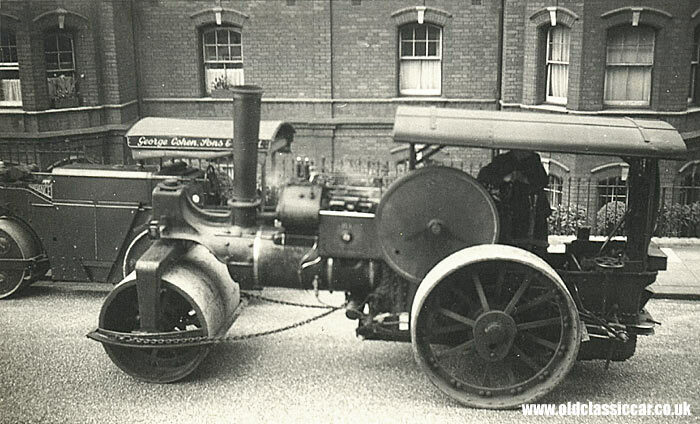 A further set of photos showing this steam roadroller at recent shows can be found on Steam Scenes. 2. Two more road rollers. This photo harks back to the days of professional road repair, where the new surface is properly rolled into place, before any cars get to set a wheel upon it. Two fine road rollers are in shot. The steam roller to the right looks like another Aveling & Porter to me, whereas to the left is one of the new-fangled diesel jobs, in this case an Advance diesel road roller, produced by Wallis & Steevens. Just visible on the Advance's canopy is the name "George Cohen", presumably its owner.